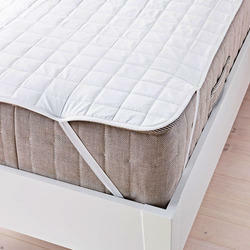 A mattress protector is an item of removable bedding that sits on top of mattress to provide protection to the mattress. Some mattress protectors also provide protection to the individual sleeping on the mattress from allergens and irritants such as dust mites, bed bugs, mold and dead skin (like dandruff). Our water-resistant Mattress Protector are manufactured from an exclusive 100% hollow non-woven fibre sheet with cotton cloth on top and non-woven fabric in bottom. Although the surface of a mattress can be cleaned with a vacuum cleaner, it is very difficult to completely remove stains from most standard mattresses. 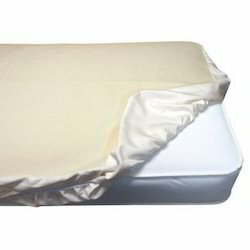 The simplest form of a mattress protector is a lightly quilted fitted sheet. It provides protection against liquids and from dust mite allergens. It allows mattresses to breath naturally. We bring forth a unique range of Feather lite Mattress Protector. We are able to produce range of Mattress Protector in different designs. For allergy relief, to prevent bed bugs from entering your mattress and for incontinence issues, there is nothing better for a healthy sleep environment than a good mattress protector. Our water-resistant Mattress Protector are manufactured from an exclusive 100% hollow non-woven fiber sheet with cotton cloth on top and non-woven fabric in bottom. Prolongs the life of your mattress from Aegis. We are dedicatedly engaged in manufacturing and exporting a matchless range of Mattress Cover to our esteemed customers. These covers are soft and are available in different colors, designs, shapes and sizes. They can also be customized as per the requirement of the clients. It is highly appreciated by the clients for its comfort and is being offered at the best rates in the market. Additionally, these covers are stylish, trendy in their design and have long life. Looking for Mattress Protectors ?